A fantastic photograph of a tram laying flat on it's side in Hylton Road, Sunderland in 1933 with people milling around. Superb detail. Sent in by © Allan Edwards. 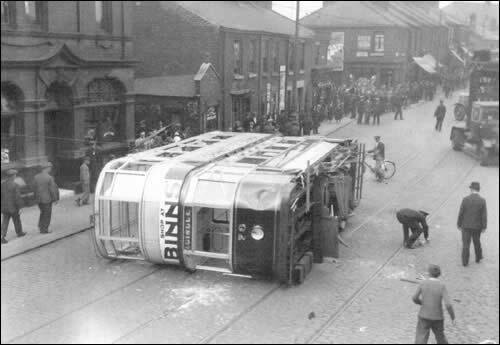 At around 3 o'clock on Thursday 15th June 1933, tram 70 achieved lasting fame as "The Tram That Fell Over". The car had just left Millfield station on the way up to Kayll Road, and it had reached the bottom of the bank down to the "Mountain Daisy" pub, when a brewer's lorry came out of the side street just opposite Ailesbury Street and the two vehicles collided. Car 70 toppled over with a terrific crash which was heard by people several hundred yards away and lay across the road with its windows and side smashed in. From what witnesses said it appeared that the tram had swayed slightly as it took the slight bend and then struck the offside front wheel of the lorry violently, wobbled and then crashed over onto its side. The bow collector was buckled as it slowed the rate of fall by being entangled with the overhead wire, which was stretched like a bowstring and still attached to the car as it lay in the road. Most of the windows were shattered as the tram hit the ground and others were broken by rescuers who were soon on the scene helping the dazed passengers and crew from the stricken tram. Thirteen people were found to be injured, though none of them seriously. Police and ambulances were soon on the scene - followed by a recovery crew who brought up one of the old balcony cars wrong-line from the depot half a mile down the road. Charles Hopkins, the General Manager, directed operations and car 70 was dismantled and taken away for repair. The event was memorable for being the first serious accident to befall a Sunderland tram and forever afterwards number 70 was renowned as the car that fell over. It was dismantled before it was removed and was not put back into service until February 1934."